Super Savings Item! Save 36% on the TABOR TOOLS GL18 20-Inch Bypass Mini Lopper, Makes Clean Professional Cuts, 1-Inch Cutting Capacity, Tree Trimmer and Branch Cutter Featuring Sturdy Medium-Sized 15-Inch Handles. by TABOR TOOLS at Halo Grow Box. MPN: Gl18. Hurry! Limited time offer. Offer valid only while supplies last. POWER THROUGH 1" diameter thick branches with a quick chop and without struggle. This bypass lopper is designed for making fast and precise cuts that will preserve the health of your plants. PRUNING MADE EASY! COMFORT GRIP. The rubberized grips on handles provide comfort and good grip. This smaller 20" model will allow you the work close to the body and efficiently navigate around tough limbs. 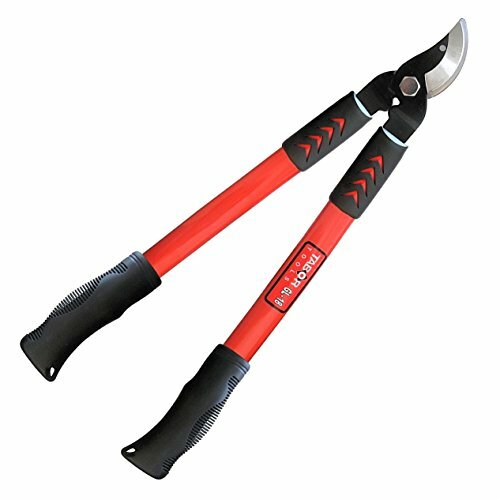 The ergonomic 15" handles offer optimal grip to ease the cutting of any branch. Overall, this is a lightweight, medium-sized and balanced tool which is easy to carry, even for elderly gardener. This lopper will soon become YOUR BEST FRIEND IN THE GARDEN! SHARP AND STURDY BLADE. The fully hardened carbon steel blades will stay sharp, even after some heavy use! Low-friction coated gliding blade can be re-sharpen which will prolong item's life. EASY STORAGE: The lopper features a smart uncomplicated storage option - simply fit the holes in the blades together and hang it on a peg or hook. You can also hang the lopper up side using the hole in the handles. If you have any questions about this product by TABOR TOOLS, contact us by completing and submitting the form below. If you are looking for a specif part number, please include it with your message.